Double Gold Cup winner Kauto Star is on the verge of retirement after his poor showing in the Punchestown Gold Cup on Wednesday, his owner has suggested. Jockey Ruby Walsh pulled the 11-year-old up well short of the finish line after he fell well back from the lead, and now owner Clive Smith admitted he may be forced to make a difficult decision in the autumn. “If he doesn't spark after a break we'll be sensible." He told BBC Sport. "He's been a brilliant horse, who's had a wonderful career and I'm not desperate for him to prove anything," added Smith. The champion steeplechaser has enjoyed a record braking career that saw him surpass the iconic Desert Orchid in 2009 by becoming the first horse to win the King George VI chase at Kempton four times in a row. 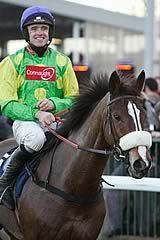 He was also famed for his famous battles with free bet favourite Denman, and became the first horse ever to regain the Gold Cup earlier that year after losing out to his rival in 2008. However the 11-year-old started to show signs of his age when he fell during the Gold Cup last year, and has so far only won one race so far this season, at Down Royal in November. Trainer Paul Nicholls believes a snap decision on his future mustn’t be made, and that it is important to see how he recovers from his disappointing run at Punchestown. "If he came back in the autumn and ran once more like that, then obviously we would retire him." The Somerset trainer commented. Free bets placed suggest this could be the end for the crowd favourite, although spectators would prefer him to end his illustrious career on a high.